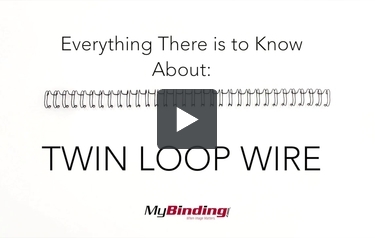 If you have already chosen your cover and it's a bold color statement piece, then you should consider switching it up and get white twin loop wires! These will make any cover pop with its minimalistic, clean coloring. And we have three different brands to choose from: GBC, Renz, and our own brand. Make sure to pick between the 3:1 and 2:1 pitch wire, because they'll only work on certain machines. The 2:1 is for larger projects while the 3:1 is for smaller documents. You can get them either in a certain length or buy a spool of them for custom lengths. The choices are yours, so get creative! White 2:1 wire with a gloss finish. Premium bright white 3:1 twin loop wire. Premium gloss white 2:1 twin loop wire. Premium white 3:1 twin loop wire. Premium white 2:1 twin loop wire. Bright shiny white twin loop wire.